This weekend, a group of complete strangers is getting together in a Melbourne warehouse to test their limits and push themselves to the brink of absolute exhaustion...with a 24-hour hum. Yep, that’s right, we said hum. 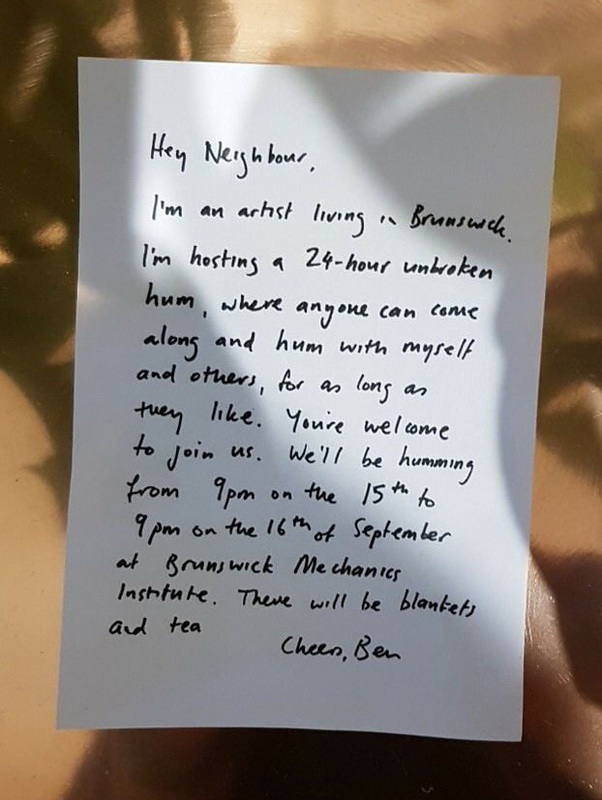 Held in Brunswick (of course), Retreat invites Melbournians to trade-in their usual Saturday night for a more harmonious alternative. Leave any preconceptions at the door, don’t ask questions and instead relish the opportunity to be completely and unapologetically unproductive. All you have to do is hum. Born out of the belief that anybody can hum, Retreat is a part of this year’s Melbourne Fringe Festival. Stay for as long or as little as you like—it doesn’t matter. The point is to embrace the bizarre and challenge yourself to try something new. Who knows, there might be something oddly comforting about sharing a room with strangers who look just as silly as you do. We spoke to organiser Ben Landau and asked him exactly what the heck he was thinking when he created Retreat. So...why are you doing this? In my art, I try to find ways for people to get involved in something they wouldn’t normally undertake. Other than looking silly, one limitation to taking part is people’s fear that they can’t do the activity (like singing, or something physical). Humming is something that most people can do, even if they think they’re tone deaf. Through my experimentations and trials, I’ve noticed that many humming voices come together to create something extraordinary. The sounds merge and overlap and result in an incredible drone sound where everything seems to vibrate. By humming, you actually vibrate your own nose, face and jaw. The combination of hearing everyone else hum and your own vibrations mean you lose yourself completely in the mix. The 24 hours is to give enough time for different elements to emerge. Each person will find their own reasons for doing it. Have you ever hummed for a long time before? I’ve been humming up to 6 hours at a time in preparation for this durational work. I feel like it's a bit like preparing to run a marathon, where you test your endurance for a set amount of time, and then hopefully have enough to keep going for the whole distance (which is why I need people to come along and help). How long can one human sustain a hum? I’m not sure, I haven’t timed it. One hum could be defined by the time between breaths or the total time. If you mean one breath, this probably has a maximum cycle of around 20 seconds. After a while, humming becomes like breathing with sound and vibration. In my practices sometimes I forget that I’m humming. I’m hoping that I can go for 24 hours. What have been people’s reactions so far? People react in all kinds of ways. The most common question is ‘why?’. But lots of people are really enthusiastic and want to take part, and mostly because they have some experience of a choir or sonic immersion that they’ve enjoyed. What are you expecting people to feel? I think people will get out of it what they put in. If you’ve ever been part of a team sport there will be that kind of camaraderie. If you’ve ever sung in a choir, there will be that kind of sonic immersion. If you’re religious, you might feel closer to God. If you’re looking for solace you can find it. Any tips on humming correctly? It’s not hard. Start slow, don’t try and rush or take really deep breaths which can make you hyperventilate. The idea is that everyone taking part shares the load. Will you be providing throat lozenges or other humming aids? After a while, you can get a dry mouth. So there will be water and tea. What would you say to people who don’t understand the hum? I haven't given one simple reason why I’m doing the hum, so maybe it’s reasonable to not understand it. If I was holding a séance, starting a cult, selling mindfulness snake oil or something deeply personal like a wake, then it would be easier to comprehend and justify. I am intrigued about why it aggravates some people so much. It can be easy to judge something quickly before you’ve tried it or even before it’s happened. So I would invite anyone to give it a go with an open mind and see what they get out of it. Where: Brunswick Mechanics Institute, 270 Sydney Road, Brunswick. When: From 9pm, 15 September until 16 September. In other news, season three of Serial is dropping next week. Humdinger.